Materials and Methods : Eighty extracted, single rooted permanent upper anterior teeth were instrumented up to size 50, teeth were sterilized and inoculated with E.faecalis, subcultured in BHI broth which had its optical density adjusted to approximately 1.5Χ10 8 colony forming units (CFUs) ml -1 by comparing its turbidity to a McFarland 0.5 BaSO 4 standard solution. 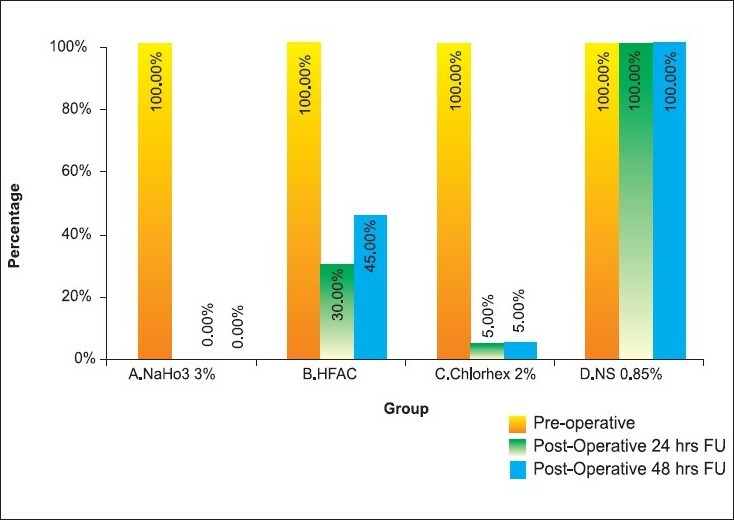 After incubation for 24 h, the contaminated root canals were divided into four groups and subjected to action of NaOCl 3%, CHX 2%, and HFAC with physiological saline as a positive control. Sterile paper points were selected to take the sample of the bacteria and transferred to tubes containing 5ml of BHI broth and then incubated for 24 and 48 h, followed by agar plating of the resultant broth turbidity on Enterococcus confirmatory agar. Results : Data obtained were analyzed statistically for differences using chi-squared test, comparing different groups, with a significance level established at P<0.05 and 3% NaOCl showed no growth postoperatively, CHX and HFAC showed reduction of postoperative growth compared to physiological saline and, were statistically significant (P<0.05). Conclusion : In the present study, sodium hypochlorite, CHX, HFAC all were significantly effective in eliminating E. faecalis and sodium hypochlorite showed the maximum anti-bacterial activity against E. faecalis. The use of electric energy in the form of high-frequency alternating current (HFAC) for root canal disinfection has been proposed by Novel. Based on similar principle, a HFAC system (Endox Endodontic system) has been developed. As per the manufacturer, this system works by thermoablation of pulp tissue and elimination of microorganisms present in the root canal. All tissues possess a molecular structure that is sensitive to the action produced by electromagnetic fields generated by a high-frequency current. The flow of electrons generates a packet of electromagnetic waves that releases a considerable quantity of energy in the field involved by the electrical discharge and in immediately surrounding areas. There are three main effects: increase of local temperature (between 300°C and 500°C), increased percentage of ozone (O 3 ) due to ionization of the medium, and production of UV rays. The later are a by-product of the spark generated by the flow of electrons in the medium. These effects are assumed to act synergistically, eliminating the content of the root canal by vaporizing all organic and inorganic components. The system emits high-frequency electrical pulses through a probe, which is available in three different sizes. The Endox Endodontic System is also provided with an electronic apex measuring device regulated such that "zero" corresponds to 1 mm from the foramen. The safety of the device is increased by an automatic device that inhibits pulse emission at that point and beyond. The present in vitro study was undertaken to reassess the antimicrobial efficacy of 3% NaOCl, HFAC current, and 2% CHX, in comparison with physiological saline, in root canal disinfection. A modified version of Foley et al. 1983,  Fegan and Steiman 1995  in vitro model for testing the antibacterial activity of medicament was used in this study. A sample of 80 freshly extracted, human single rooted, permanent upper anteriors with fully formed apices were selected. The teeth were cleaned with hand scalers under tap water to remove calculus and other tissue remnants if present, and later stored in physiological saline at 37 o C to prevent desiccation. Conventional access preparations were made with No.012 tapered bur, in a high-speed airotor handpiece. The patency of each canal was determined using a no. 15 K file, till it was visible at the apical foramen. Necrotic pulp tissue, if present, was removed from the canal with a barbed broach. The root canals were instrumented 1 mm beyond the apical foramen with K-type files up to size 50 and then flared. Irrigation with tap water was performed during the procedures. Following the root canal preparation, the enlarged apical foramen was sealed by means of epoxy resin to prevent bacterial leakage. To make handling and identification easier, the teeth were then mounted vertically in plaster blocks. All the teeth were then sterilized in an autoclave for 20 min at 121 o C.
The experimental suspension of E. faecalis was prepared in BHI broth, which had its optical density adjusted to approximately 1.5Χ10 8 colony forming units (CFUs) ml -1 by comparing its turbidity to a McFarland 0.5 BaSO 4 standard solution. The plaster blocks containing the autoclaved teeth were opened in a laminar air flow cabinet to maintain aseptic environment during the whole procedure. Each root canal was inoculated with 10ul of the E. faecalis suspension using sterile 1 ml tuberculin syringes. The blocks were then placed inside stainless steel boxes and incubated at 37 o C for 24 h.
In the present study, five teeth per group were tested for sterility of root canals preoperatively, after autoclaving at 121°C for 20 mins. It showed no growth and served as negative control. After incubation for 24 h, the contaminated root canals were divided into four groups. Group A- 20 specimens of inoculated teeth were subjected to irrigation with 2 ml of 3% NaOCl solution. The solution was agitated with a size 30 K type file and left in the root canal for 5 min. Group B- 20 specimens of inoculated teeth were subjected to HFAC application. The electrode was inserted into the radicular canal area, one impulse was given in the coronal area, another impulse in the middle third area, and two impulses were given in the apical third area using apical measurement function (as per the manufacturer's recommendation). Group C- 20 specimens were subjected to irrigation with 2 ml of 2% CHX solution. The solution was agitated by hand with a size of 30 K type file and left in the root canalfor 5 min. Group D- 20 specimens of inoculated teeth were irrigated with 2 ml of physiological saline and these served as the positive control group. Irrigants were delivered in the canals by means of a 3 ml plastic syringe with a 25-gauge needle. The pressure applied by the operator on the syringe was sufficient to allow a flow rate of 4 ml of irrigant/min. The experimental teeth were then irrigated with 1 ml of normal saline solution. Sterile paper points, size 40, were selected to take the sample of the bacteria from the root canals. Paper points were left in the canal for 1 min and then transferred to tubes containing 5 ml of BHI broth. Tubes were vortexed for 5 min and incubated at 37 o C for 2 days. The occurrence of broth turbidity was indicative of viable bacteria in the root canal. Samples from test tubes showing turbidity were streaked with nichrome wire loops on agar plates, and incubated at 37°C for 48 h, for the confirmation of Enterococcus colony growth. Data obtained were tabulated and analyzed statistically for differences using chi-squared test, comparing pairs of groups, with a significance level established at P<0.05. Group A treated with 3% NaOCl as an irrigating solution showed 100% reduction of growth of E. faecalis after 24 and 48 h. The results were statistically significant (P=2.54E-10, after 24 and 48 h) when compared to physiological saline. Group B treated with HFAC showed 70% reduction of growth after 24 h (P=3.476E-06), and 55% reduction of growth after 48 h (P=9.81E-05) that was statistically significant compared to physiological saline. Group C treated with 2% CHX showed 95% reduction of growth after 24 and 48 h (P=1.79E-09) compared to physiological saline that was statistically significant. All the samples in Group D treated with physiological saline showed 100% growth [Figure 1]. Figure 1: Group-wise comparison of positive growth result at various intervals. The in vitro model used in this study was adapted from that used by Foley et al, 1983  and Fegan and Steiman 1995  which allowed a comparative evaluation between different irrigation solutions because the bacterial inoculums and the bacterial strain tested were standardized. In addition, this model enabled easy handling and a more effective control of environmental contamination. The complete microbiological procedure was carried out in Laminar Air Flow cabinet (LAF) to prevent contamination. LAF equipment was essential for proper performance of sterility tests and aseptic filling and assembling operations. McFarland 0.5 BaSO 4 standard solution was prepared and used to match its turbidity with B.H.I. broth cultured with E. faecalis because its optical density corresponded to 1.5x10 8 colony forming unit/ml. In the present study, 3% NaOCl has been used as an irrigant, which showed 100% growth reduction. It is a broad spectrum antimicrobial agent with vital tissue dissolving capacity. It is a predentine solvent and hence it increases dentine permeability by opening up dentinal tubules. Sodium hypochlorite remains one of the most widely used irrigants in endodontic therapy but its toxicity to periapical tissues remains a principle concern. Chlorhexidine has been used in various concentrations (0.002-2%) with different periods of contact time between the disinfectant and various microorganisms. As per these results, 2% CHX solution was far more efficient in the shortest period of time than were all other concentrations tested  and with a relative absence of toxicity,  chlorhexidine binds to the hydroxyapatite component of the dentine tissue,  and gradually releases bound chlorhexidine, which protects the canal against microbial colonization beyond the actual medication period. Because of these reasons, 2% chlorhexidine was used in this study. The present HFAC using Endox Endodontic system is capable of giving an output of 312.5 KHz at 100 W, for 0.1 sec through active electrodes into the root canal. Measurements made in vitro have estimated that the increase in temperature in apical area reaches a maximum of 1­­­9±4 o C following each electrical pulse, and that the mean cooling time was approximately 40±6 sec. This increase in temperature seems not to damage periradicular structures. According to other studies, a 10°C rise sustained for 1 min is considered compatible with normal bone repair, but higher temperatures or longer application times may cause bone necrosis and its replacement with fatty tissue. Endox pulses vaporize smear layer and organic tissue, including nerves, in the field involved by the electrical discharge and in immediately surrounding areas. In multiple studies, this system has shown to be effective in suppressing bacterial contamination of root canals. The Endox device used with four electrical pulses had shown optimal efficacy when used after mechanical instrumentation. In the present study, group B showed 30% growth after 24 h, which was increased to 45% after 48 h. This could be attributed to culture reversal, with time microbes can recover and multiply using remnant of organic debris. Using saline as a baseline, 3% NaOCL was 100% effective in eradicating E. feacalis over a 24 h period, while 2% chlorhexidine and HFAC were 95% and 70% effective in E. feacalis eradication, respectively. The present study demonstrated that sodium hypochlorite was highly potent bactericidal agent against E. feacalis with complete bacterial eradication. Both chlorhexidine and HFAC were also effective against the microorganism but were not as effective as NaOCL. Effectiveness of all three disinfectants was statistically significant when compared to physiological saline. The magnitude of antimicrobial effect was influenced by the experimental methods, biological indicators, and exposure time. It will be quite different in mixed cultures present in a dynamic biological root system, as usually occurs in vivo. Thus direct extrapolations to clinical conditions must be exercised with caution because of the obvious limitations of in vitro studies. Other properties beyond antimicrobial activity must also be investigated, such as minimum inhibitory concentration, tissue dissolution capacity, detoxification of any endotoxin, and acceptable biological compatibility, before a final choice of disinfectant is made. 1. Vertucci FJ. Root canal anatomy of the human permanent teeth.Oral Surg Oral Med Oral Pathol 1984;58:589-99. 2. Sjogren U. Influence of infection at the time of root filling on the outcome of endodontic treatment of teeth with apical periodotitis. Int Endod J 1997;30:297-306. 3. Madison S, Anderson RW. Medications and temporaries in endodontic treatment. Dent Clin North Am 1992;36:343-56. 4. Shih M, Marshall FJ, Rosen S. The bacterial efficacy of sodium hypochlorite as an endodontic irrigant. Oral Surg Oral Med Oral Pathol 1970;29:613-9. 5. Harrison JW, Hand RE. The effect of dilution and organic matter on the antibacterial property of 5.25% sodium hypochlorite. J Endod 1981;7:128-32. 6. Izu KH, Thomas SJ, Zhang P, Izu AE, Michalek S. Effectiveness of sodium hypochlorite in preventing inoculation of periapical tissues with contaminated patency files. J Endod 2004;30:92-4. 7. Spangberg L, Engstrom B. Toxicity and antimicrobial effect of endodontic antiseptics in vitro. Oral Surg Oral Med Oral Pathol 1973;36:856-70. 8. Pashley EL. Cytotoxic effect of sodium hypochlorite on vital tissue. J Endod 1985;11:12;525-8. 9. Jeansonne MJ, White RR. A comparison of 2% chlorhexidine gluconate and 5.25% sodium hypochlorite as antimicrobial endodontic irrigants. J Endod 1994;20:276-8. 10. White RR, Janer LR, Hays GL. Residual antimicrobial activity associated with a chlorhexidine endodontic irrigant used with sodium hypochlorite. Am J Dent 1999;12:148-50. 11. Lin S, Zuckerman O, Weiss EI, Mazor Y, Fuss Z. Antibacterial efficacy of a new chlorhexidine slow release device to disinfect dentinal tubules. J Endod 2003;29:416-8. 12. Jenkins S, Addy M. The mechanism of action of chlorhexidine. J Clin Periodontol 1988;15:415-24. 13. Siqueira JF Jr, Rocas IN. Polymerase chain reaction based analysis of microorganism associated with failed endodontic treatment. Oral Surg Oral Med Oral Pathol Oral Radiol Endod 2004;97:85-94. 14. Molander A, Reit C, Dahlen G, Kvist T. Microbiological status of root filled teeth with apical periododontitis. Int Endod J 1998;31:1-7. 15. Sundqvist G, Figdor D, Persson S, Sjogren U. Microbiologic analysis of teeth with failed endodontic treatment and the outcome of conservative re-treatment. Oral Surg Oral Med Oral Pathol Oral Radiol Endod 1998;85:86-93. 16. Hancock HH 3 rd , Sigurdsson A, Trope M, Moiseiwitsch J. Bacteria isolated after unsuccessful endodontic treatment in a North American population. Oral Surg Oral Med Oral Pathol Oral Radiol Endod 2001;91:579-86. 17. Rocas IN, Siqueria JF, Santos KR. Association of Enterococcus faecalis with different forms of periradicular diseases. J Endod 2004;30:315-20. 18. Rocas IN, Jung IY, Lee CY, Siqueira JF Jr. Polymerase chain reaction identification of microorganisms in previously root filled teeth in a south Korean population. J Endod 2004;30:504-8. 19. Safavi K, Spangberg I, Langeland K. Root canal dentinal tubule disinfection. J Endod 1990;16:207-10. 20. Haapasalo M, Orstavik D. In vitro infection and disinfection of dentinal tubules. J Dent Res 1987;66:1375-9. 21. Foley DB, Weine FS. Effectiveness of selected irrigants in the elimination of Bacteriodes melaninogenocus from the root canal system an in vitro study. J Endod 1983;9:236-41. 22. Steward G. Comparative evaluation of the antibacterial effects of intracanal Nd:YAG laser irradiation ,an in vitro study. J Endod 1995;21:8:415-7. 23. Stuart CH, Schwartz SA, BeesonTJ. Enterococcus faecalis: Its Role in root canal treatment failure and current concepts in retreatment. J Endod 2006;32:93-8. 24. Estrela C, Ribeiro RG, Estrela CR, Pécora JD, Sousa-Neto MD. Antimicrobial effect of 2% NaOCl and 2% chlorhexidine tested by different methods. Braz Dent J 2003;14:58-62. 25. Schafer E, Bossmann K. Antimicrobial effects of chloroxylenol and chlorhexidine in the treatment of infected root canals. Dtsch Zahnarztl Z 2000;55:671-9. 26. Lee LW, Lan WH, Wang GY. An evaluation of chlorhexidine as an endosonic irrigant. J Formos Med Assoc 1990;89:491-7. 27. Harrison JW. The effect of dilution and organic matter on the antibacterial property of 5.25% sodium hypochlorite. J Endod 1981;7:128-32. 28. Haffner C, Benz C, Das HR Endox- Endodontie-system: Weitere Laborergbnisse und erste Klinische Resultate. ZWR 1999;108:670-4. 29. Eriksson AR, Albrektsson J. Temperature threshold levels for heat induced bone injury: A vital microscopic study in the rabbit. J Prosthet Dent 1983;50:101-7. 30. Haffner C. High frequency current in endodontic therapy: An in vitro stydy. J Dent Res 1999;78:117. 31. Lendini M, Alemanno E, Migliaretti G, Berutti E. The effect of high- frequency electrical pulses on organic tissue in root canals. Int Endod J 2005;38:531-8.